Should I mount my carbon filter horizontal or vertical ? 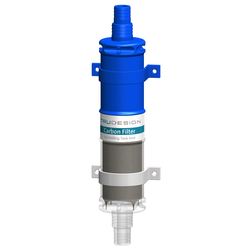 All carbon filters must be mounted vertically. Horizontal mounting will result in the carbon granules settling and leaving a space above for air to pass without going through the carbon. If it is not practical to mount vertically, an angle of 45 deg will be OK. We suggest mounting the carbon filter with the clear end to the hose from the tank so you can check that no liquid has got through the hose and into the filter.